First let me say, that my law firm provides new entrepreneurs with an excellent, cost effective, full-service business startup process. But this client had already done something (I am not sure if it is complete) to get his business launched, so I concentrated on meeting him where he is. The answer to this question depends heavily on a further understanding of the entrepreneur’s situation. This client is in a service industry that includes providing his customers with creative materials. With that information, and his answers to a few more of my questions, I could immediately say that he first needs a template contract with his customers. When an independent contractor (like my client) provides creative services, the default rule in copyright law assigns copyright ownership to the independent contractor. (By the way, the default rule is different for employees…but that is the subject of a different post.) While this may seem great for my client, in fact this may not be what he–or his customers–want to happen. Furthermore, it’s possible that his customers, or at least some of them, don’t know this default rule, a fact that could lead to future tensions if not addressed right at the start. So it is best to have the details of copyright ownership spelled out in a written contract. Agreement on copyright ownership is not the only reason to have a written contract with your customers, but protection of your intellectual property is one of the key factors we take into account when we draft such agreements. 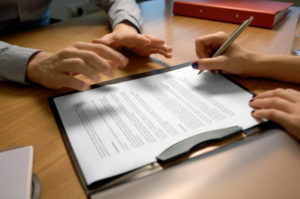 Be sure to see your attorney to get one or more template contracts you can use with your various types of customers. And ask your attorney why s/he includes each clause that appears in your template. Being a wise consumer of legal services will help you immensely.